Wow! What a week. Last weekend I was lucky enough to attend the first ever #edchatnz conference organised by the amazing Danielle Myburgh and her extraordinary organising committee. It was a mindblowing experience and I took so much away from it. I also really enjoyed sharing it with my mother, @majessti as we’ve never spent time together as colleagues. Friday started with a plenary session from Danielle Myburgh and HPSS Principal Maurie Abraham – both of whom I really enjoyed hearing speak. I then headed off to Dianne Cavallo‘s session on Design Thinking in the classroom. I spent a good chunk of time discussing ideas with my mother in the middle session before finishing off the day with some time spent in Steve Mouldey‘s class and then attending the unconference session. I loved everything but the stand out points for me were definitely sitting on Steve’s class and Ros’s workshop, and coming back to school they have certainly been the ones that have influenced me most. So, the big question – the question really – is what do I do with all the awesomeness now I’m back at school? Easy – take the leap of faith (thanks @boonman for the inspiration to do this). On Monday night I sat down with the curriculum, photocopied every level 4 page and started scribbling and highlighting – finding links with “Communities” – our term 3 theme. Yes, I already had plans in place but they weren’t quite doing it for me or (as it turns out) my students. They lacked an overall cohesion, but once I started going through those curriculum areas with a highlighter things started to come together in a big way. 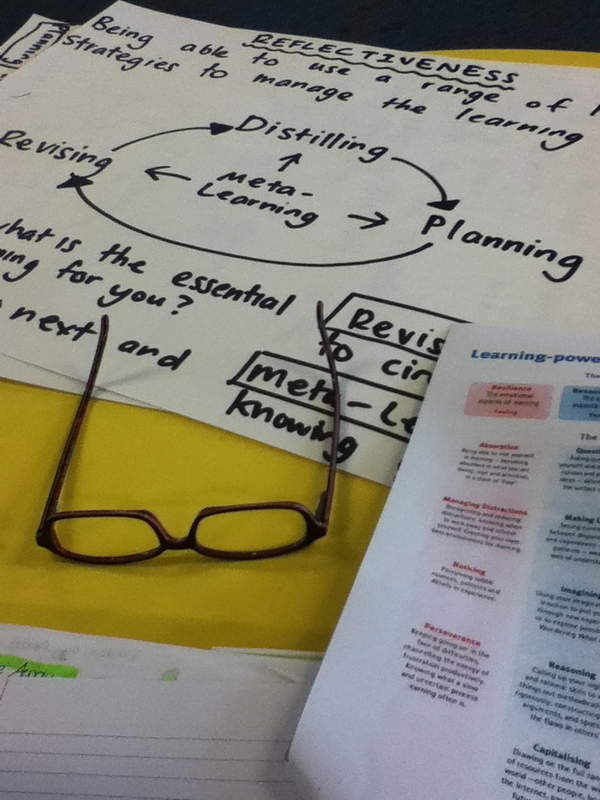 Once highlighted I cut up the curriculum (photocopies – not my actual curriculum doc – don’t worry!) AOs and started to group them. I’ve loved the idea of multi-curriculum area modules since I first heard HPSS staff talk about them, and seeing them in action on Friday only made me more excited. I really believe this is a powerful way to teach. So I grouped my AOs, and suddenly all these awesome connections became apparent. Everything just clicked. I developed 4 modules – two maths based, two English based for the term. Just like HPSS I gave them names – we’re currently working on Community Perspectives and Vital Stats, and will then go on to Trading Me and Persuading Me later in the term. I developed little blurbs for them a la HPSS and set learning objectives just like I would with any unit plan. Only this time I didn’t put them into my old planning template – this time I tried something new. Ros had given us a copy of the HPSS planning template and the focusing questions and visual layout made a lot of sense to me, so I reworked it into a version for me school (well, just for me at this stage – but one of the DPs is very interested in it and how we could use it across the school). We are a Building Learning Power School, which means we use Guy Claxton’s approach to developing learning muscles. As a staff we see this as an extension and an expansion of the NZC’s key competencies, so it was obvious to me that Claxton’s teaching toolkit would form the centre of the planning as it underpins what we do as teachers. And I added a few things – particularly looking at diverse learners and focusing on Kaupapa Māori principles of education. I knew that I wanted to focus more on coaching students in their learning, something we’ve been talking about a lot more as a school lately, and I also wanted to spend more time on concepts and developing conceptual understanding. The SOLO Taxonomy has provided the perfect vehicle for doing this – and my students have responded really well to it. But that’s a whole other blog post. Monday and Thursday we spend all morning on an English-related module, Tuesday and Wednesday are maths/science-related. The introduction of my time has formalised what used to be ‘finishing time’ and also gives students some scope for their own passions – something they’re very excited about (thanks HPSS for the name). As syndicate we’ve decided to go from ‘fitness’ to active recreation which again gives the students more choice, and also removes any connotation of physical education, which isn’t always as active as we’d like – this is about being active! Learning Focus is an opportunity for us to develop learning skills, solidify our understanding of the SOLO taxonomy and explore what it means to be a Building Learning Power school in more depth. So, what do the students think of all this? Well, we’ve only had two days of working with the new timetable and module structure, and already they love it! I’ve had so many students come up and say how much they like having time to really get into one context/topic – even some of my quiet, less opinionated students have come and talked to me about it. One of my students who doesn’t always find learning easy and is VERY shy too came and told me how much easier she has found the new way of learning with a huge grin on her face. Teacher win! I love it. Of course it’s going to be a work in progress and will need refining, but everything is and my students know that as much as I do. But even on the first day it just felt so right and I came away on an absolute high like I haven’t felt in months. I loved having more time to go deep and not being constrained ‘maths time’ or ‘English time’. The depth of thinking I saw in that first lesson was so sophisticated – I actually felt guilty that I hadn’t given them opportunities to reach these depths sooner! The language students were using to discuss communities and they concepts they were coming up with really validated what I was doing. Now I just can’t wait to continue! I am an Intermediate/Middle School teacher based in Wellington, New Zealand. At school I am a year 7/8 classroom teacher, German specialist teacher and the Teacher in Charge of Dance. I love geeking out with tech and am excited to be e-Learning Leader at school for 2014.